Langley School Daffodil Craft and Country Fayre. 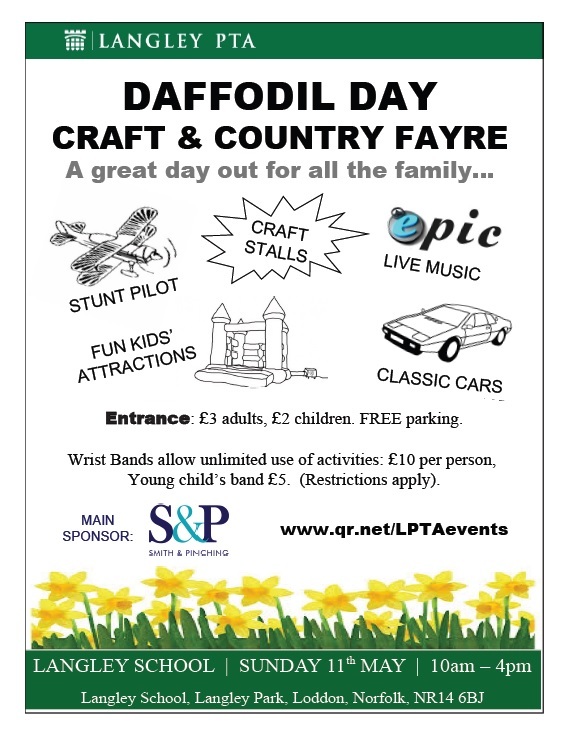 Make a date with EPIC on May 11th (10 til 4) and get ready to groove this year at the Langley School Daffodil Craft and Country Fayre. With six bands carefully picked to tempt our teenagers out of bed on a Sunday and balmy late spring weather to lounge in, this year should rock! The Symphonic Wind Band and, of course, our Langley talent will also be there to keep music going through the day. Music not your thing? There’s plenty more to tempt you and your family to have a good time. Not to be missed International Display Pilot, Mark Jefferies will be performing at 1:00 o’clock. This nine time British aerobatic champion, who placed 3rdin the World Aerobatic Masters in 2011, came last year to stun our crowd with his dizzying swoops, spirals and heart stopping stunts. Langley School’s Headmaster, Mr Dominic Findlay, was reportedly lost for words and rooted to the spot as Mr Jefferies performed extreme aerobatic manoeuvres in close proximity to Langley School’s English Heritage buildings. We are delighted that he will joining usagain this year –this time a little closer to the Rugby Pitch than the Sports Hall –which should provide both a fantastic view for all and less stress for the Senior Management Team and Governors. With the purchase of an attractions wristband (£10 per person, 3 bands for £25 or 4 bands for £30 or a pre-school band for £5) your children can burn off their energy with unlimited access to our great additional attractions : Bungee Trampolines; Water Zorbers; Eaton Vale Climbing Wall; Rodeo Bull; Human Table Football; Bungee Run; four Bouncy Castles and two Assault Courses without any “please, please may I just …” throughout the day. If your joints aren’t up to the Tumble and Thrust of the Kids Attractions you can still take a turn on the Langley School Model Railwayby separate donation. In their quest to make it to the woods, the school’s Model Rail buffs have been very busy laying more track since last Daffodil Day, which is sure to please the many supporters of this quirky and interesting addition to school life. They will also be joined by the usual array of fascinating machines and their enthusiastic owners. If it’s not action you seek, we’ve got something for you too. Classic carshave increasingly been a feature in the last few years and Daffodil2014 will not disappoint. We’ve got an additional classic car enthusiast on board this year, who has opened up new avenues for us, so we hope you will see something that will really tickle your fancy. Last year, we had over 70 tempting craft, small business and market stalls: artisan ice cream and meats, sweets, jewellery, bags, woodcarving just to name a few. Dog Agilityis always great fun and we are pleased that our canine performers will be returning to entertain and potentially shame those of us with less obedient friends. We also have corporate standsand local charitieswho would like to advertise what they do to make our communities better and model boat and air plane clubsdemonstrating what they get up to in their spare time. Last but not least,the tranquil, woodland walkbehind the school –which will delight with bluebells –culminates at the beautiful chapel where you can view artwork from Langley School students juxtaposed with original medieval painting. Hungry and thirsty? You must be bynow! You won’t need an oversize breakfast before you come….. With a BBQ; Tea, Cake and Refreshment Tent; the school kitchen going with snacks and sandwiches; a Veggie Take Away caravan; Panther Beer; Market stalls and Ice cream vendors, you can order something you will enjoy and relax somewhere that interests you. So where are the Daffodils, you may ask? For 40 years, the Langley School Daffodil Craft and Country Fayre was held before Easter. It’s difficult to imagine, after this glorious, East Anglian spring, that we had to postpone last year due to particularly inclement weather. There will still be Daffodil’s, to honour that tradition, but they may not be of a natural kind if spring keeps up its pace this year. Real Daffodils or placebo Daffodils, Langley School will honour its tradition of hosting Daffodil Day, whatever the elements may throw at us, and in a way that will bring pleasure to all who attend. Daffodil Day is organised by a volunteer group of parents and teachers and run by additional volunteer groups of teachers, students and parents who aim to raise money for both internal ventures and external charities. This year, we are proud to support both the Benjamin Foundationand the Norfolk Carer’s Trust. Come and join us for a great day out for all your family. Venue: Langley School, Langley Park, Loddon, Norfolk, NR14 6BJ. Entry cost: Adults £3, Children £2. Attraction Bands: £10 per person, 3 bands for £25 or 4 bands for £30 or a pre-school band for £5. Free Parking. * Height/weight restrictions on some attractions, at the discretion of the attraction provider. Please check before queuing.